Follistatin-344 is an autocrine glycoprotein. During this peptide studies its effect on the anterior pituitary inhibiting the production of follicle stimulating hormone, myostatin has been revealed, thereby improving muscle growth. Follistatin has widespread popularity among athletes who want to gain muscle mass. Also Follistatin-344 is not detected in doping control. The peptide has been studied not so long ago and only in 2009 all studies have been completed and Follistatin-344 became available for sale. But despite this not long existence the peptide has gained many supporters of its use among athletes, especially this substance is actively used in bodybuilding. 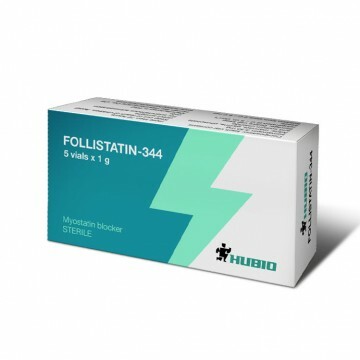 As a rule, Follistatin-344 does not cause side effects, even if they do occur they are reversible and are temporary in nature, without affecting the daily life. deterioration of folliculogenesis, the effect may have a negative impact on the work of ovaries, when women used the drug. Other complications Follistatin-344 does not cause. Among the shortcomings of peptide athletes mark only the high cost of the drug, in the rest it contributes actively to power performance and muscle growth. By the reviews of athletes it's possible to gain 3-4 kg. 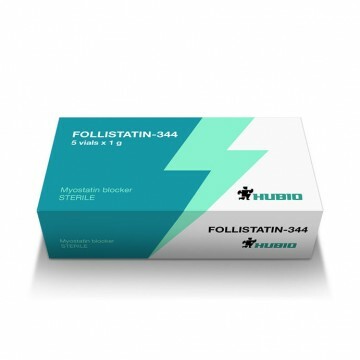 of lean body mass with the use of Follistatin-344. Follistatin-344 application course lasts for 10-20 days. The standard dosage is 100 mg per day. The peptide is administered subcutaneously. Actively used in powerlifting and bodybuilding.